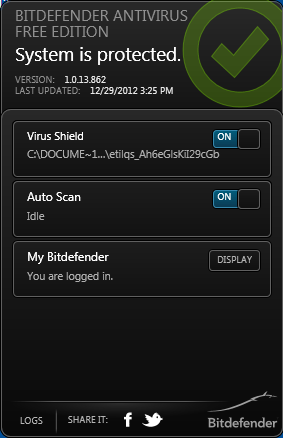 Bitdefender Antivirus is one of the most popular security software available for Windows computers. Now the company released a free edition like AVG, Avast and Microsoft. So from now users can download and use Bitdefender Antivirus 2013 software for free of cost. Bitdefender Antivirus Free Edition, the one antivirus solution that protects you discreetly, efficiently from viruses and malwares. Bitdefender Antivirus Free Edition now fully optimized with latest arrival operating system Windows 8. Free edition comes with simple user interface, there is no any other complicated settings and check boxes. Bitdefender Free edition has some important features like Real-time shield, Active virus control, HTTP scanning, Anti root kit and more. Bitdefender Antivirus Free Edition uses an intelligent mechanism which can automatically take the optimum decisions to keep the defense levels high, in a manner that also avoids slowdowns. You have to register to use Bitdefender Free edition, and also you can sign in with your Facebook and Google account.